Woohoo! We just passed 250 backers and our $9,973 goal, which means that the Year of Puzzles will be a reality. Thank you so much for your support! In our next update, we'll talk about stretch goals. For now, let's celebrate with this very cool palindromic puzzle by Eric Harshbarger, a puzzle author, palindromist, and Lego sculptor extraordinaire. Not only will Eric be creating one of the puzzles in the Year of Puzzles, but we'll also be publishing an ebook of Eric's unique palindrome puzzles in 2013. 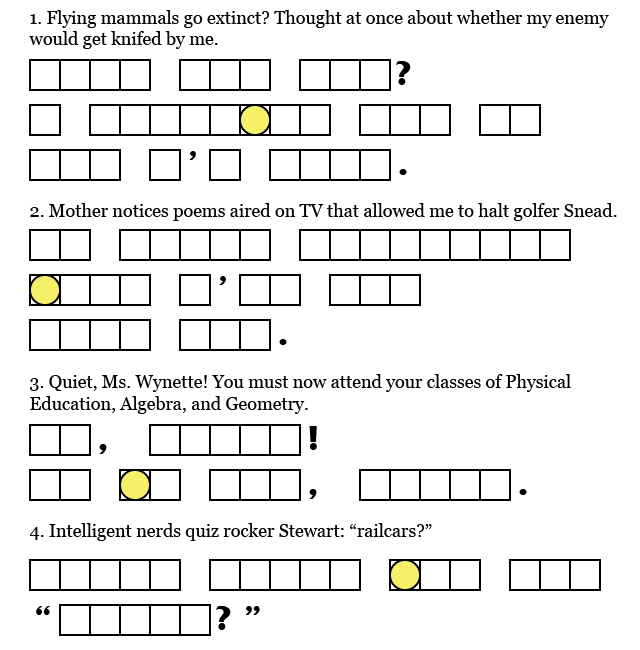 In this puzzle, each of the answers is a palindrome, meaning that the letters in each of the answers (excluding punctuation and spaces) are the same whether read left-to-right or right-to-left. Each clue has the same meaning as the corresponding answer. For example, if the clue was "Ms. Perón: meek, prone to copying others", the answer would be EVITA: TIMID, IMITATIVE. Figure out the four palindromes, then get the 7-letter answer from the circled letters. The T-shirt rewards, for those who pledge at the Expert Level or higher, will each have a one-of-a-kind puzzle, which nobody else will have! The Upgraded T-shirts stretch goal will be unlocked when 53 or more people pledge at the Expert Level or above! If the Upgraded T-shirts stretch goal is unlocked, everyone whose pledge level includes a T-shirt will get to pick their own answer to the puzzle on their T-shirt! What's that mean? If you want to pick your own answer to the puzzle on your T-shirt, encourage, convince, cajole, or even coerce your friends to pledge at that level or higher, so we get to 53 or more people. Thanks! One of the puzzles uses semaphore code. One of the puzzles is an acrostic, though it may not be a straight acrostic forever. When a puzzle involves a path, you frequently want to pick up something along the way. Look for things that are highlighted or standout -- something colored, larger letters, etc. If you get a long phrase from a puzzle, it is usually a clue to a short final answer. Note: To avoid spoiling puzzles for others, please do not put the answer to any puzzle in the mini puzzlehunt in the comments. To verify an answer, visit http://www.puzzazz.com/kickstarter. Some clarification on the t-shirt information. 1) Every t-shirt will have a unique puzzle on it. The puzzles will be similar but different. 2) If we get to 53 shirts or more and unlock the Upgraded T-Shirts stretch goal (and we're getting close! ), you will get to pick the answer on your own shirt in the post-campaign survey. The answer you pick has a length constraint (it's a word, like the final answers you've been getting) and is subject to approval (e.g., no obscenities). Somebody else could pick the same answer, but they would still have a different puzzle. If you are getting multiple sets of rewards (see the FAQ on how to do this), you can pick the same answer or different answers for your shirts. If you pick the same answer, the puzzles will still be different. 3) If the Upgraded T-Shirts stretch goal is not reached, we'll pick all the answers. At the bottom of the main page, we're maintaining a summary of the currently active puzzles, including their answer lengths and whether they were hidden. Every puzzle that is given directly to you is part of the mini puzzlehunt, unless we say explicitly that it is not. The puzzles and partial puzzles in the project image and the project video are not part of the mini puzzlehunt (some are incomplete and cannot be solved anyway). There are also some hidden puzzles whose answer lengths are given. The hints at the bottom of the updates also provide some clues as how to find the hidden puzzles. There are no puzzles hidden within the FAQ or in any comments.